Sexual and domestic violence are community problems that require community-based solutions. But the dominant way to look at sexual and domestic violence is through an individual lens, not a community-wide lens. For example, researchers examining domestic violence homicides in Michigan found that the media often did not even identify these cases as domestic violence (see April Zeoli’s presentation at the 2010 American Public Health Association Mass media patterns and trends of intimate partner violence reporting ) Most services and systems approach these as individual reports (like a police report) or as an individual client. As a prevention practitioner, I stress that sexual and domestic violence are community issues. Such violence takes place in a cultural context that perpetuates the violence. And to prevent violence, we have to make shifts on the community and social level. Public health taught me to think about “population based” solutions that change the environment to address a problem. While effective collection of forensic evidence and shelters are very important, interventions like these by themselves are insufficient to end sexual and domestic violence. 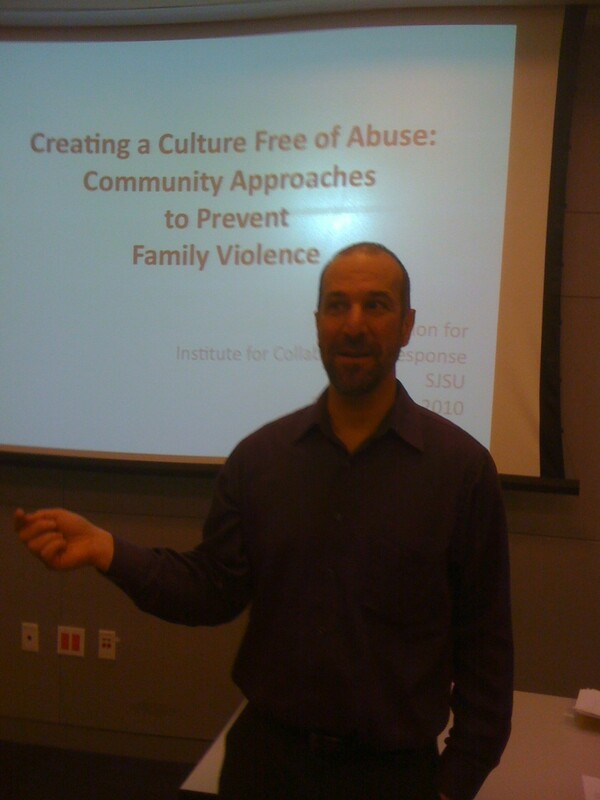 Last week I explored these themes as I piloted a two hour workshop titled Creating a Culture Free of Abuse: Community Approaches to Prevent Family Violence for the Center for Collaborative Response at San Jose State University. In this workshop I explored the solutions to family violence that require community responses. I highlighted several examples of community based prevention efforts: working with Transforming Communities work with faith communities, engaging coaches to work athletes on their teams to prevent violence through the Family Violence Prevention Fund’s Coaching Boys into Men campaign, community organizing strategies in Dorchester, MA by Close to Home, engaging men with the A CALL TO MEN Milwaukee Healthy Manhood Project, and resources for everyday people to end domestic violence by Creative Interventions. Click here for a handout from the presentation. In the next few months, check out this blog where we will feature podcasts highlighting these community prevention efforts and more about efforts to put the community at the center of prevention.